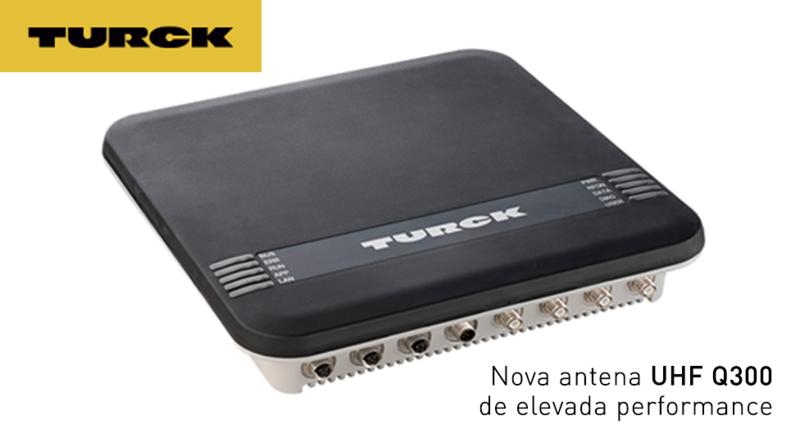 Turck recently launched the new high performance UHF Q300 antenna. It is the latest development of the manufacturer responding to the other challenges of the industry 4.0 and UHF applications. The Q300 series supports new communication types (for example the OPC UA) at the same time that it allows programming or implementing platform independent middleware functionalities. Industrial design with IP67 protection class allows the reading and writing antenna to be installed under the harshest industrial conditions. Gateway installation solutions, which require the application of several read / write points and antenna multiplexing, are now simpler in terms of integration and installation. The new Q300 antenna is considered one of the most powerful in the market, with 2W (ERP) power, automatic vertical / horizontal polarization, possibility to connect up to 4 UHF passive antennas for increased reading and writing field (quite usual in gantry applications ). This equipment has an integrated web server, being possible the programming via CoDeSys 3, compatible with Pactware UHF DTM and presents the same interface of RFID "U" control of Turck. In terms of connectivity, two M12 DXP connectors are available that contain a total of 4 IOs programmable for triggers and outputs, for example, for signaling use. There are also 4 RP-TNC coaxial connections for passive external antennas for gain gain and read / write field, as well as an integrated Ethernet interface that allows all Q300 readers not only to be connected directly to industrial controllers, ERP or other systems, but also receive a Power over Ethernet (PoE) power supply. Being a Codesys device it is considered multiprotocol and can be integrated directly into all Ethernet networks with Profinet, Ethernet / IP or Modbus TCP master. For more information, please contact our commercial department or our brand manager Turck.